What can a Blue Monkey do for you? 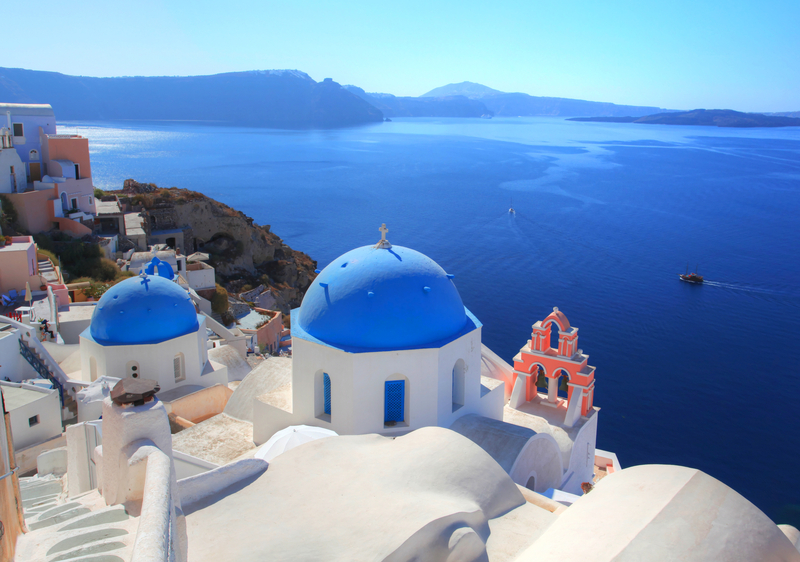 There are many different ways to arrive in Santorini Island, Greece, however; arriving by private charter yacht cruising into the inner harbor Caldera is the most extraordinary. The present Caldera was created sometime around 1645 BC, by a huge volcanic eruption, during which volcanic ash and debris covered an ancient and very wealthy Minoan trading city near present day Akrotiri, Santorini. The disappearance of this city, may be the basis of the legend of the “Lost City of Atlantis”. After cruising into the Caldera in Santorini by charter yacht, head ashore to explore the Akrotiri Excavations, where extraordinary wall murals depicting Blue Monkeys were found. 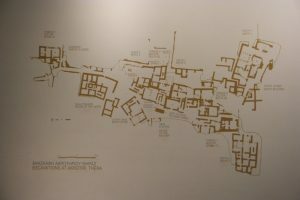 Due to this lost city being well preserved by volcanic ash; this site has been determined to be the ruins of a Minoan Bronze Age trading city given similarities found in artifacts, tablets, and wall paintings to other Minoan Bronze Age cities currently being excavated. There is no doubt, due to the artifacts and wall paintings being uncovered in Akrotiri, that this was a very wealthy Minoan trading city. 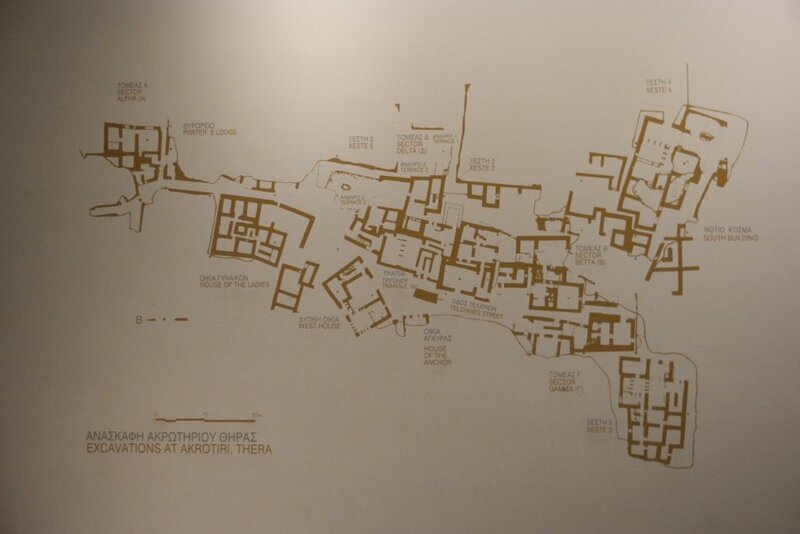 And also no doubt, that tremors before the final eruption in the 1600’s BC gave warning to the inhabitants to flee the city, with time to pack most personal belongings, as unlike Pompeii, there are no remains of inhabitants or of many personal items found in this excavation. The Minoan Civilization was far spread with sophisticated trading cities founded along important trading routes. 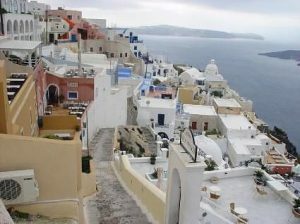 When settling far flung trading cities such as this on Santorini, the Minoans brought with them various items and aspects of their homeland life. Most notable were pet Blue Monkeys, now called the Green Vervet Monkey, which hails originally from sub-Sahara Africa. These monkeys appear in wall frescos found in the Akrotiri Excavations, and are similar in painting style and look to monkeys found painted in a wall mural in a partial excavation of another Minoan settlement called Knossos on the island of Crete. 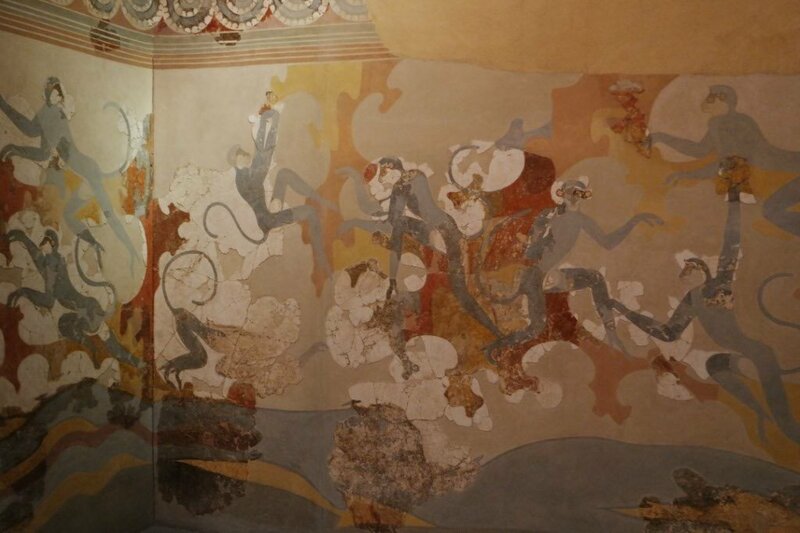 Most interesting though, as in other Minoan wall murals, the monkeys appear to be performing tasks. Some theorize that the Blue Monkeys were spiritual intermediaries between humans and Gods, however others theorize that the Blue Monkeys were trained to help with everyday tasks, as supported by some wall murals found showing the monkeys wearing harnesses. After visiting the Akrotiri Excavations, visit the Archeological Museum in Fira where one of the most famous murals removed from a house being excavated in Akrotiri, depicting Blue Monkeys can be found. At this point, it is anybody’s guess as to what part of life in ancient Minoan Bronze Age cities the Blue Monkeys played. As Akrotiri is only 5% excavated perhaps further evidence will be found that can be seen on a future yacht charter including Santorini.